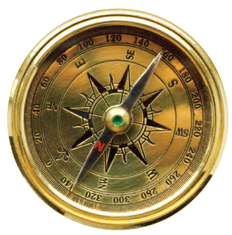 ​The School for Ethical Education has been supporting the character-based decision making process with The Golden Compass since 2006. Using SEE's Golden Compass workbook, teachers and students are encouraged to complete the introductory exercises together and create a skill base for use with ethical dilemmas students face in life. Following the basic skill development, The Golden Compass presents 56 dilemmas to help students master the process. The dilemmas are circumstances that are relevant to the life of middle school and high-school students while at school, home and in the community. There is often more than one good option to solve life's dilemmas. The Golden Compass provides activities to help students practice reasoning skills while validating the importance of positive character to guide decisions. The analysis process of The Golden Compass also supports the practice of reading analysis identified in the Common Core objectives. The same analysis and evaluation strategies taught with The Golden Compass can be applied to student analysis of characters in literature, history or cases in science and health classes. Contact SEE to arrange for a teacher professional development workshop to implement the use of the Golden Compass and/or a combination of teacher professional development and student assembly programs. Free on-line Professional Development Webinar (two-part series) provided with every purchase of The Golden Compass workbook.